Sewell on the go customers across Hull and the East Riding are being given the chance to sample local products, as well as find out more about where and how they are made. The taster sessions have been organised as part of the Hull 2017 UK City of Culture Made in Hull season. As a proud Major Partner in the action-packed year of events, Sewell is involving its staff and members of the public in various activities, celebrating the year to remember, giving them the chance to get involved and creating a lasting legacy. 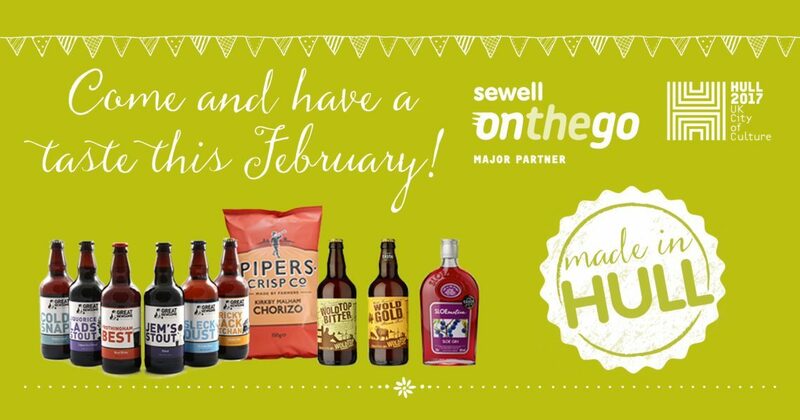 Local suppliers to all 12 Sewell on the go stores will be holding tasting sessions of their products at various sites until February 25. Katherine Batch, Sewell on the go Sales Director, said: “The aim of the tasting sessions is to support local businesses, so it’s good for them, good for us and great for the customers. “We stock more than 100 locally-made products and we’ve listened to our customers regarding what they like to see on our shelves. “Shopping local is so important and we want to celebrate local trade and produce. Local suppliers taking part include Jackson’s Yorkshire’s Champion Bread, Wold Top Brewery, Amos and Tom’s Gourmet Popcorn, Great Newsome Brewery, Sloemotion and Peaks Top Farm Fabulously Fruity Fruit Wine. Victoria Kennedy, Marketing & Communications Manager at Jacksons, which is based in Derringham Street, West Hull, said: “We’re delighted to be involved with the Sewell on the go taster events to celebrate Hull UK City of Culture 2017. “These taster sessions are a great opportunity for us to sample our Jackson’s Yorkshire’s Champion bread and hopefully gain some new customers. For more information about our suppliers, you can view our programme here.